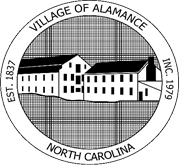 For information or more information regarding the Home Occupational Ordinance and/or Submitting an application please contact the Village of Alamance Town Clerk. Describe the type and nature of your business that will take place on the premises:. 1. Total number of persons employed at the residence or are employed in the activity (including owner). 2. Total number of persons in question #1 who are NOT full-time residents in the dwelling. 3. Number of available parking spaces for residence. b) How many at one time? c) At what time of day? 5. Will there be any deliveries to the residence? 6. Will the activity: - be visible from any adjacent street or property line of the address specified above? Generate noise, odor, fumes, smoke, or other abnormal characteristics? Use more than two vehicles and/or trailers that will be parked/stored on the property? Involve the sale of products or delivery of services at the address specified above? Include on-site assembly or manufacturing of products? Involve distribution or reception of materials or products? Involve storage of materials/products in a detached accessory building? 7. Please explain or describe any activity that was answered yes in item #6. Compliance with attached section, Village of Alamance Zoning Ordinance, Home Occupation Ordinance.I hereby certify that I am making application for myself and that the statements given are true to the best of my knowledge.